It is obvious to several people that I have been extremely lazy the past week. I have been struggling to catch up with the memory hole feature after attending (and presenting at) a few great meetings. 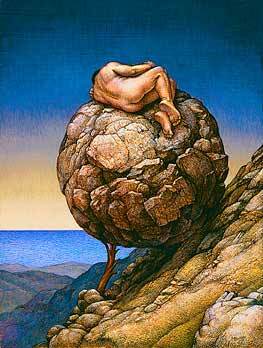 The excellent picture of Sisyphus sleeping is with kind permission of artist Michael Bergt. Sisyphus is condemned to roll a large rock up a hill. Upon reaching the top the rock rolls back, and the task has to be repeated - endlessly. The story appears to be one of eternal and pointless labor. I haven't said much about recent progress with the first of the three shonky Procter and Gamble publications. I felt it best to allow time for the excuses to be finalized, and to allow others to comment first. A few examples of those comments are referenced. I don't necessarily agree with all commentary, but generally people are not morons. I am finding the "Memory Hole feature" quite useful myself as a way of understanding how we got where we are. To catch up I am going to skip the dates 13-20 November. I'll get back to filling in the blanks over the next few weeks. Colquhoun, Professor David (2007-11-06). Universities Inc. in the UK, Corporate Corruption of Higher Education: part 2. Baty, Phil. "Expert admits he did not have full access to data", Times Higher Education Supplement, 2007-10-12. Silverman, Ed. Boning Up: Journal Tightens Disclosure Policy. Pharmalot. Woodhead, Michael (2007-10-28). A double dose of dodgy data. Saunders, Professor Peter (2007-11-01). Actonel, Dog that Did Not Bark in the Night. Institute of Science in Society. Poses, Roy (2007-10-12). Journal Changes Policy After Blumsohn Case. Fantastic website! Kepp up the good work. My message does not seem to have been registered. I was very pleased to have met at the GSS yesterday, and thank you for the very enlightening talk! I gave you the top score. I apologise for the one slimebag. Jeeesus - what fucks these bone researchers are. A University of British Columbia and Vancouver Coastal Health Research Institute study has found that a popular class of osteoporosis drugs nearly triples the risk of developing bone necrosis, a condition that can lead to disfigurement and incapacitating pain. The research is the largest study of bone necrosis and bisphosphonates, a class of drugs used by millions of women worldwide to help prevent bone fractures due to osteoporosis. It is also the first study to explore the link between bone necrosis and specific brands of bisphosphonates, such as Actonel, Didrocal and Fosamax. Researchers found that all three brands had similar outcomes.